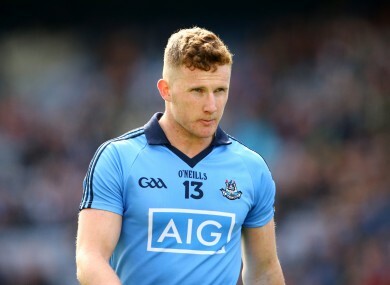 Cruciate ordeal has left Ciaran Kilkenny hungrier than ever. CIARAN KILKENNY IS savouring the buzz of championship football again. The Dubs star missed all of last summer through injury but marked his return last weekend with a man of the match performance against Longford. He said: “For me to get my first game back was a really happy day for me and my family, to be actually back out on the field again on a championship day. Kilkenny tore his cruciate ligaments in March 2014 and missed almost an entire year of inter-county action before returning in the league this spring. The long absence from doing what he enjoys most has only strengthened his love of the game. “In the first three months of the injury you can’t do any running or kicking or turning or anything like that, so it was weird for me not being able to do any of that sort of stuff,” he explained. “All you can really do is cycle or aqua-running or that sort of stuff. So you’d miss out on that — the buzz of actually going out and kicking balls in your local field. But now that I’m back, I have a lot of time to do that. And even just going out with a bag of balls, you’d appreciate that a lot more. Now that he’s back in blue and targeting a second All-Ireland medal, the Castleknock clubman feels that the ordeal has made him a mentally stronger player as well as improving some of his physical attributes. “When we did tests and that kind of stuff when I came back to see if I was on the same kind of level, some of my scores I improved on. It lets you focus in on certain aspects of your body composition a lot more because you’re in the gym so much. Mentally you improve as well because you’re after getting over this monumental struggle and it makes you appreciate a lot more and it makes you a lot hungrier as well. Email “'Mentally you improve because you're after getting over this monumental struggle'”. Feedback on “'Mentally you improve because you're after getting over this monumental struggle'”.